Beets (Beta vulgaris) An Old World crop known to the Romans, but not cultivated for roots until much later. Beets aren't just red—be sure to try other types of beetroot as well! Make successive sowings of beetroot seeds for harvests all season, starting 2-4 weeks before last frost in spring, and continuing until a month before first frost in fall. (Sowings in intense mid-summer heat may not germinate satisfactorily.) Sow where the plants are to grow, 1/2 inch deep, 4-6 inches apart, in full sun on a neutral (non-acid) soil. 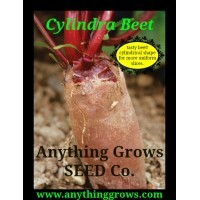 Beet "seeds" are really capsules containing multiple seeds, so thinning to single plants is necessary. If the young, growing beetroot plants are thinned gradually, the thinnings can be enjoyed as greens. Keep soil evenly moist. When mature, lift and store in the refrigerator or root cellar. This beautiful beet has deep reddish-purple leaves! Very sweet and delicious, the baby leaves are a rage in salads. The beets are tasty too, and have pretty pink rings inside. Heirloom. Maturity 60 Days/35 days for greens. ..
Italian heirloom with bright, candy-red exteriors & interior flesh beautifully marked in alternating rings of cherry red and white. Delicious sweet flavor & fine texture. Great tasting leafy tops. 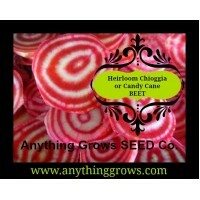 Chiogga beets do not bleed like some other red beets! ..
A wonderful Heirloom from Denmark, it is famous for slicing with its long, cylindrical roots. 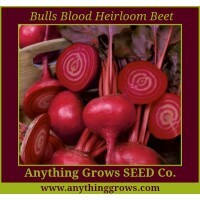 Produces much more uniform slices than round beets. This tender and sweet variety is also known as "Butter Slicer" because of its wonderful texture. Maturity 56 Days ..
Detroit Dark Red Beet. 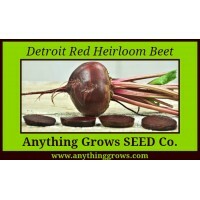 The most popular, old standard, all-purpose, red beet, uniform and smooth, blood-red flesh that is sweet and tasty. 14-inch tops make good greens. Heirloom variety introduced in 1892. Maturity 50 Days/28 days greens. ..
Gorgeous five-color mix is a visual knockout in both garden and kitchen. Enjoy as sweet baby beets & let the rest size up. 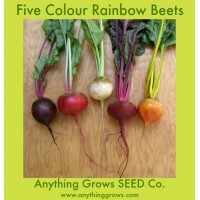 Includes deep purple, orange-yellow, candy-striped, cerise & white.The Five Colour Beet Mix includes the varieties: Chioggia (striped), Alba (white), Bulls Blood (deep dark red), Touchstone yellow (Golden yellow), and Magenta (magenta/red). Maturity 55 days. START SEEDS OUTDOORS: In early spring, when danger of frost is over, sow seeds in well-worked, fertile.. 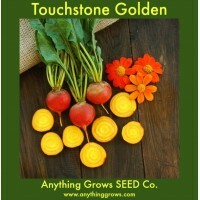 Touchstone Golden Beets - Hard to find! These are a good choice for roots and greens, with flesh that turns golden-yellow when cooked. Unlike red beets the flesh doesn't bleed. Sow early to avoid bolting. Maturity 55 days. ..